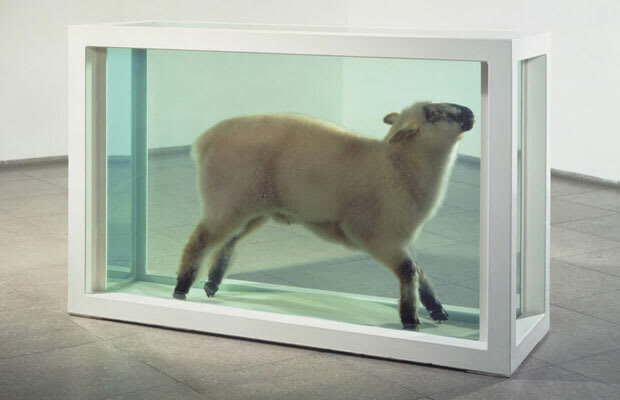 One of Hirst’s earlier animal-in-formaldehyde works was Away from the Flock, a white lamb suspended in a vitrine. When the work was on view in London in 1994, an artist from Oxford famously came and poured black ink into the tank. The work was not significantly damaged and was repaired within 24 hours, however, Hirst pressed charges against the vandal who was sentenced to two years probation. Later, however, Hirst capitalized on the man’s crime, creating and selling a book that overlaid an image of Away from the Flock with a black cloud that resembled the ink floating at the top of the tank. One man’s probation is another man’s profit.